the scheduled general elections draw near. This trend, if allowed to continue, has enormous potential to undermine democratic values, crush civil liberties and erode the credibility of the electoral process. cases tracked, 56 were journalists, 21 were involved in public protests, 13 activists, 24 critics (including social media commentators, bloggers and active citizens, 5 public figures, 6 members of the Indigenous People of Biafra (IPOB), 6 students, 4 members of political opposition parties, 4 labour union leaders, 5 religious leaders, 4 teachers and 2 clergymen. 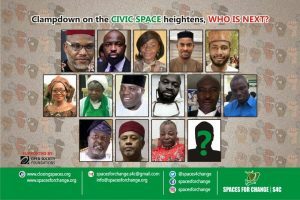 As statistics show, the civic space has been under siege as no profession or any aspect of human endeavour has been spared. 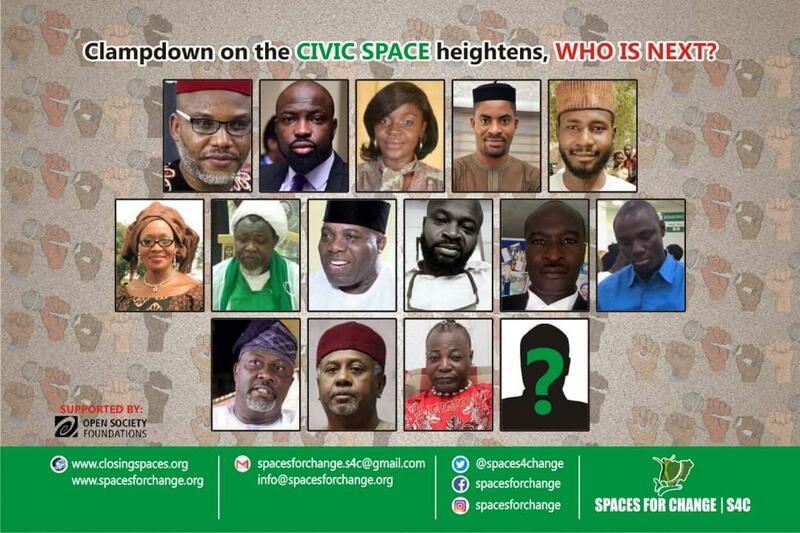 Further aggravating the deteriorating state of civic freedoms is the coordinated attempts to shift the onslaught to other arms of government, particularly the legislature and the judiciary. On Tuesday, August 7, 2018, heavily–armed security operatives of Nigeria’s Department of State Security Services (DSS) barricaded the entrance of the Nigerian federal parliament preventing federal lawmakers from accessing their offices to carry out their lawful legislative duties. As if that was not sacrilegious enough, the latest plot to forcefully remove the Chief Justice of Nigeria, Justice Walter Onnoghen through a knee-jerk asset declaration trial, has left many Nigerians in shock. The marked increase in the exercise of overbearing governmental power has not only created an atmosphere of fear in the country, but has also considerably contracted the spaces for civil society and civic engagement. We make bold to state that civic spaces are closing to such a level that poses a threat to the country’s hard-earned democracy. Activists, local and international non-governmental organizations, media houses, religious groups, social movements now operate in fear, with many of them wondering who the next victim of state repression will be. Those who dare speak up, including those sympathetic to opposition political parties face higher risks of being arrested, detained and left to languish in prison, with phantom charges slammed on them. As evidence shows, journalists and activists engaged in drawing attention to pressing issues and influencing change bear the brunt of these attacks. participating in critical conversations and debates that inform and enrich the quality of governance. Justice Walter Onnoghen, among others. We implore the government to channel its energy towards upholding the human rights principles that give democracy a meaning. With bated breath, Nigerians look forward to seeing the serious measures put in place to provide level playing field for all political parties for the conduct of transparent elections.